The season had another potential turning point: Napoli, Roma, Sampdoria and Juventus in a month of football. 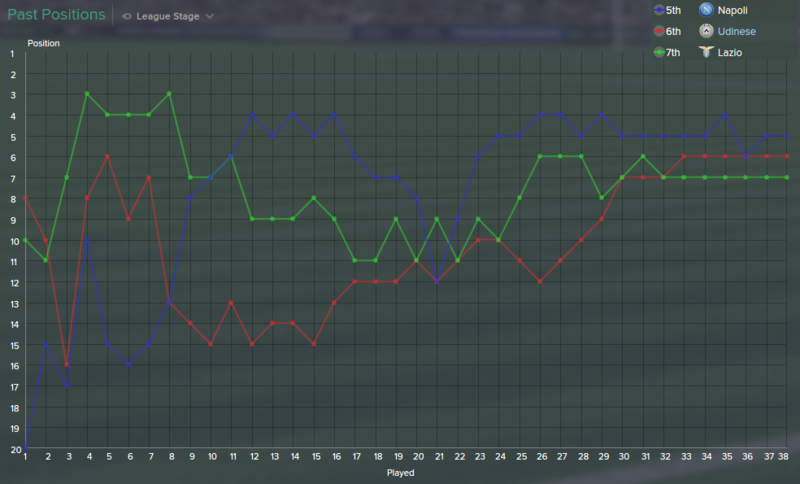 Four of the eventual top five, and we managed a respectable five points, including a massive 3-2 win against Juve. At this point we had a much easier run of fixtures and were able to push on from 12th (game-week 26) to our end position of 6th. In the end it was slightly gutting to miss out on Europe; a final-day victory over a mediocre AC Milan would’ve been enough to secure it. But the squad was beginning to fall apart at the seams and it’s possibly a good thing we won’t have all those extra games to play next season. An improved league position and cup run would do it for me. This second half of the season was partly down to the easier schedule, but also due to reinforcements during the January window. None of the new signings played a key role themselves, but they were also to make vital sub appearances to ease the pressure on other players. They were largely funded by the early-January sale of starting left-back Douglas Santos. He’s a cracking player, but negotiating Roma up to £8.75m rising to £10.75m meant he had to go. The Moneyball philosophy doesn’t merely apply to new signings; it’s also important that players are let go of at the right moment. Despite being very young, I knew Nicolas Tagliafico would be available for £3.7m and produce a similar level of performance. So those two deals were done and we had some cash left over. So we scoured the lesser leagues and found value in France. Troublesome youngster Florian Thauvin wasn’t getting on with new Marseille boss Vahid Halilhodzic, and was being left out in favour of new signing Richairo Zivkovic. This meant he had been transfer listed, with an asking price of £1.9m. With very few options out wide, he was worth the risk. This meant we could use a 4-2-3-1 at times, with Borek Dockal wide on the other flank. The other signing came courtesy of an early-release free agent signing. 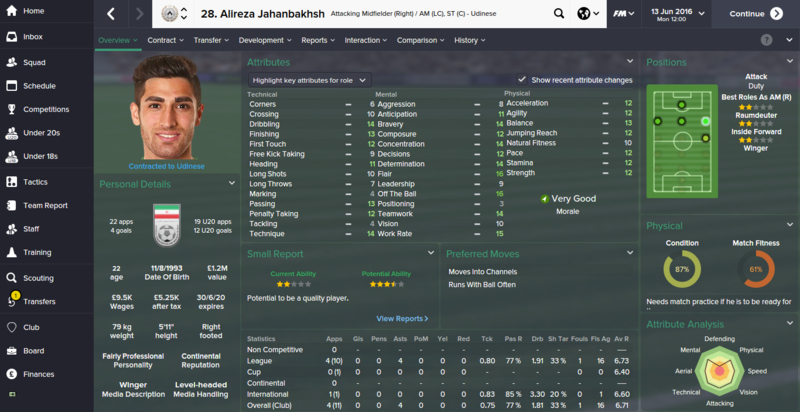 Iranian international Alireza Jahanbaksh was available on a free transfer at the end of the season, and upon agreeing the deal, we took up the option to buy him for a measly £80k. Finding a player of his ability & potential in the Dutch Jupiler league (second division) represents a major success in the Moneyball stakes. And finally was a free transfer that we weren’t able to accelerate, meaning he comes in the off-season. Despite his lack of experience, it’s one I’m very excited about because of his base attributes and huge potential. A free transfer for Paredes is an absolute bargain, and I have no doubt we’ll be able to flog him to one of the other Italian teams for an eight figure fee at some point. Given Borek Dockal’s ever-advancing age, we’ll have to start thinking about selling him before his value depreciates, and Paredes represents the perfect contingency plan. The best part is that he also doesn’t contribute towards the max of 2 non-EU transfers per season, as he’s being signed at the end of his contract. In the short-term, it’ll present some rather difficult team selections unless there are drastic changes in the Summer. With the pickup in form, a number of players put in some wonderful performances. Despite not getting fully fit until around March, Luis Muriel was able to bag a final tally of 0.66 goals per 90 minutes (total: 11), and strike partner Lucas Albertengo managed 0.63 (total: 18). This made it difficult for Antonio di Natale (who is now due to retire, freeing up £30k p/w in wages) and Matej Vydra to find game-time. But because we often used the 3-3-2-1-1, using Muriel in the CAM role as a Shadow Striker meant he limited the game-time of some midfielders too. Eventually it was Dockal, Thauvin, Muriel, Jahanbaksh and Bruno Fernandes all competing for that one slot. 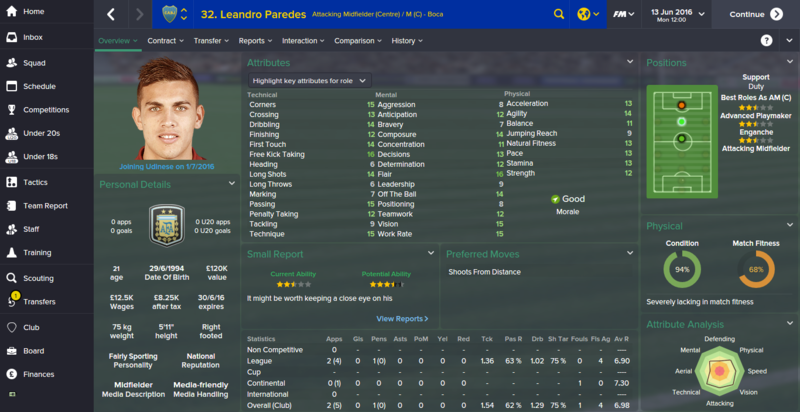 When Paredes arrives in the Summer, this will be made even more difficult. Having so much untapped potential on the bench isn’t economically efficient, so either the shape or the squad needs to be changed. Given how successful the 3-3-2-1-1 has been against two-up-top opponents, it’s a very handy weapon in our arsenal. Borek Dockal was very much the main man in midfield, and the two new January signings are yet to properly break-through. Bruno Fernandes also represents a key part of the squad and is able to play in any of the four midfield roles. The defense has also been pretty poor at times. I was expecting some major damage to be caused, with Simone Scuffet to bail us out. We had the damage, but not much of the bailing out. Scuffet will obviously improve with each passing year, but there are obvious improvements to make in defense. Jeison Murillo is already making noises about wanting to leave and it’s possible we’ll need two new CBs. Silvan Widmer and Nicolas Tagliafico were predictably excellent at full-back, making it difficult for their replacements to get much game-time at all. With no European football, it’ll likely be a similar situation next year. Ideally I’ll be able to sign someone capable of playing either side to a high level and going into the season with three full-backs. Of course our major strength was in midfield and I’m not sure how long we’ll be able to keep it together. We’ve already rejected bids from Inter & Everton for starlet Alan; he is a unique blend of defensive steel and ball-carrying ability. It’s rare to see a midfielder so defensively solid with 17 dribbling, but it perfectly suits my managerial style so I’d prefer to keep him if possible. Roberto Pereyra, who largely played alongside him, will likely be our player of the year, and will command upward of £20m if sold. But given the board have already kindly gifted us a £27m transfer kitty for the new season, it’s time to see what the Moneyball philosophy can do with a bit more of a budget. As always, you can request any additional info either in the comments section below or on Twitter. Great article Ed quick question what facepack do you use for FM15?